«©NCSX» How does a manufacturer sell the same toys twice in quick succession? Answer: Box the toys in new retail packaging. Yujin has practiced this tactic with their popular Shooting Game Historica toys and they've adapted it for their Senjou no Valkyria gashapon which originally shipped last month. When December 2008 rolls around, the same toys will be packaged in cardboard boxes instead of the plastic capsules used in the gashapon incarnation. It's not all a rehash however, four new Valkyria soldier girls join Alicia, Asara, and Brigitte as follows (from the lower left portion of the photo and moving to the right and then upwards): Rein, Edie Nelson, Jane Turner, and Selvaria Bles. In addition to the standard figures, Yujin mentions that three color variations for Alicia, Asara, and Brigitte will also be randomly packaged in the factory cases. Sega's recent Senjou no Valkyria was one of the better Playstation 3 games we've played this year. 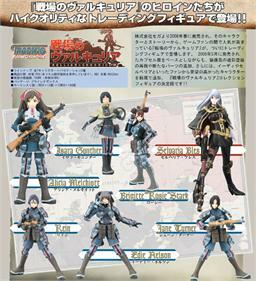 Sega's Senjou no Valkyria for the Playstation 3 was a solid sales winner when it was released earlier this year.